Today a twitter announcement showed us this. There are 3 raids start at the 14 of February. If there is any competition for other countries I do not know. What I do know there is one fro Canada and one for America. If you are based in Canada you could see Vikings a World revealed. 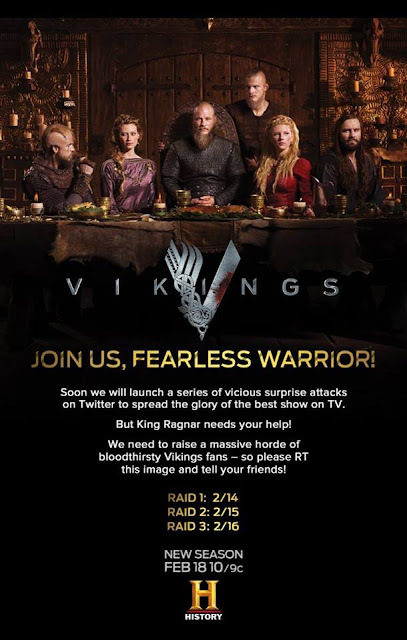 Link: http://vikings.history.ca/ You could also catch up season 3. We know there will be a documentary before Vikings season 4 starts. The documentary shows us how Rollo played by Clive Standen go on an adventure to see his ancestors in France. Also, there are a lot of promo's in different countries like China, Canada, France and America. The promo's give us a bit of information about what we could expect for season 4.